Olive oil is made by simply crushing olives and extracting the juice. “Virgin” means the oil is produced by mechanical means, without the use of any solvents or chemicals, and under temperatures that will not degrade the oil. For a virgin oil to be labeled “extra virgin,” it must pass an organoleptic (taste) test and meet strict chemical standards of Free Fatty Acid and Peroxide Value content, which are a reflection of age and quality. Balsamic vinegar is the juice or "must" of Trebbiano or Lambrusco grapes that has been cooked over an open wood fire producing a brown, syrupy liquid. The liquid is then placed in a series of very old wood barrels and aged for a minimum of 12 years. The result of this aging process is a delicious, rich, thick and sweet vinegar. What is the proper way to store olive oil and balsamic vinegar? Heat, light and air are the primary enemies of oil and vinegar. They should be stored in a cool, dark place such as your kitchen pantry. Never leave your bottles near the stove or in direct sunlight. OLIVE & VINE uses dark tinted bottles to help protect from light and UV rays. You can also store in stainless steel containers. Olive oil and vinegar do not need to be stored in the refrigerator, even after opening. What is the shelf-life of extra virgin olive oil and balsamic vinegar? If stored properly, a high quality oil with good chemistry will last up to 18 months. To receive maximum flavor and healthy nutrients, however, it really should be consumed within a year of the crush date. This is why we rotate our inventory between the northern and southern hemisphere harvests to ensure the freshest olive oil available. Our balsamic vinegars are already aged up to 12 years for the white balsamic and 18 years for the traditional, so they will last indefinitely. 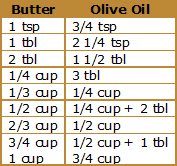 Can you replace butter with olive oil in recipes? Yes, all of our extra virgin olive oils and balsamic vinegars are gluten-free and produced in gluten-free environments. Our flavored products are infused with all natural ingredients like fruits, berries and herbs and contain no grain whatsoever. Can I bring my bottles back in for a refill? Run bottles through a full dishwashing cycle. Make sure cleaned bottles are completely dry - any moisture will affect the quality of the product. Do not reinsert the old cork - we will give you a fresh cork and relabel the bottle if necessary. What is the nutritional value of extra virgin olive oil? What is the nutritional value of balsamic vinegar?